Tap into an open-access market that's truly global. With over 1,600 ETPs (including Exchange Traded Funds) listed from more than 30 different issuers across the globe, London Stock Exchange offers easy access to investment products that reference a diverse range of asset classes and underlying markets. London Stock Exchange is a premier ETP listing and trading venue, benefiting from world-class technology, which supports a competitive ecosystem with deep liquidity to enable high quality, low cost execution. ETPs are an important and fast growing part of the global financial markets and the exchange’s unique offering continues to attract issuers and investors internationally. Hear from the London Stock Exchange team. Recent issuers share their views on why they chose London. Over 30 issuers leverage our premium trading service, SETS. With integrated market maker liquidity provision, price and trading data is disseminated to over 140,000 professional terminals, websites and private investors ensuring global product data reach. Registered market makers provide continuous pricing and a high quality pool of liquidity across ETPs listed on London Stock Exchange. 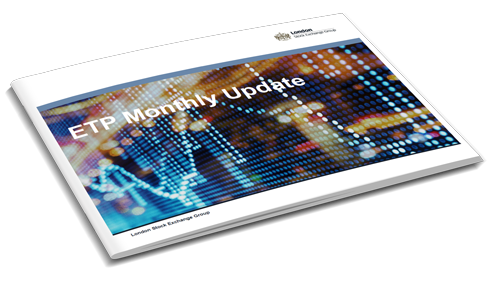 Sign up to our free monthly stats report and keep up-to-date with the key trends in a growing ETP market.